You are going to love our interiors! When you book your flight, we hope that you book us. We'll make sure that once you're in the metropolitan Houston area, you'll get to know all of the great places that are on your list and maybe then some! Our experienced chauffeurs can advise you on added places to see and experience if you end up with extra time in your day because they are able to handle all of the navigation, traffic and parking issues for you. Yes, we have been catering to these for years and we'd like to take yours on! You won't have to worry about getting caught driving at the wrong moment or dealing with the droves of people cramming up the highways - you will get to have fun with those you care about, celebrate, relax and have all of the fun that you want. We'd love to show you around our home town and all of the well-know and hidden destinations herein. Put your feet up, get your cameras ready and move about comfortably. Your only concern should be where you are going and what you're going to do when you get there. You will be the happiest group at these fantastic attractions. We even have special day rates! 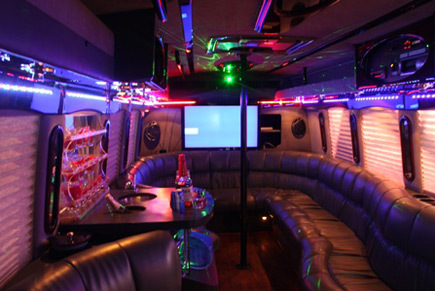 Just like with our bachelor parties, we know how to take you around and show you a good time. If you are new to the area, we will help give you suggestions; if need be. Either way, we'll give you a much more energy-filled good time and we will also help to alleviate you of any worries that you may have during the little bit of time that you get to get away. Imagine all of the room that you'll have to take your pictures, how you won't have to even get off of the limo bus to capture what you see, that you will be able to stand and take it all in and that you'll be able to have whatever soundtrack that you prefer while doing so. We can take you from place-to-place so that you make a true day of it ... get some food at one of our great establishments, full up and see the best that Houston has to offer. It's your wedding day, and you want a mode of transportation that accurately reflects your needs as a wedding group. Every wedding is especially unique, and you deserve to be treated as such. When you book with Houston Limos, you're guaranteeing a successful ceremony. We'll be glad to take you wherever it is you need to go on your wedding day, and we'll do it in a timely fashion that allow you to get the most out of your money. Call us today.